For cancer patients, understanding the odds of a treatment’s success can be bewildering. The same drug, applied to the same type of cancer, might be fully successful on one person’s tumour and do nothing for another one. Physicians are often unable to explain why. Now, U of T Engineering researchers are beginning to understand one of the reasons. Abdullah Syed and Shrey Sindhwani, both PhD candidates, and their colleagues at the Institute of Biomaterials & Biomedical Engineering (IBBME) have created a technology to watch nanoparticles traveling into tumours — revealing barriers that prevent their delivery to targets and the variability between cancers. Tiny “nanoparticles” offer great hope for the treatment of cancer and other disease because of their potential to deliver drugs to targeted areas in the body, allowing more precise treatments with fewer side effects. But so far the technology hasn’t lived up to its promise, due to delivery and penetration problems. To dismantle this roadblock, the two graduate students searched for a way to better view the particle’s journey inside tumours. They discovered that the tough-to-see particles could be illuminated by scattering light off their surfaces. It was already understood that nanoparticles were failing to accumulate in tumours, thanks to a meta-analysis of the field done by Chan’s group. But the researchers have developed technologies to look at nanoparticle distribution in 3D, which provides a much fuller picture of how the particles are interacting with the rest of the tumour biology. 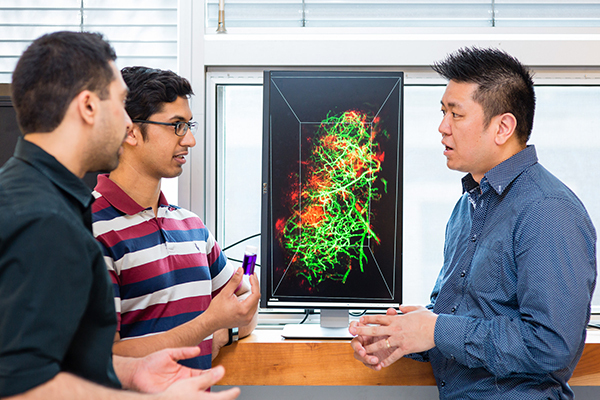 “The goal is to use this technology to gather knowledge for developing mathematical principles of nanoparticle distribution in cancer, similar to the way principles exist for understanding the function of the heart,” says Syed. The next step is to understand what in cancer’s biology stops particles from fully penetrating tumours — and then to develop ways to bypass cancer’s defences. “This is going to be very valuable to anyone trying to understand disease or the organ system more deeply,” says Sindhwani. “And once we understand barriers that don’t allow drugs to reach their disease site, we can start knocking them down and improving patient health” adds Syed.